The Movement for Rights and Freedoms’ national conference unanimously elected, as expected, MP and hitherto triumvirate leadership member Mustafa Karadaya to the post of party leader on April 24 2016. The election of Karadaya (45), a former youth leader of the MRF who was appointed secretary of the party’s organisational bureau in 2010, was a foregone conclusion after it emerged earlier this week that MRF founder and honorary president Ahmed Dogan wanted Karadaya elected. Dogan ousted the previous leader, his former protege Lyutvi Mestan, in late 2015 over what Dogan described as Mestan’s “gaffe” in siding with Ankara in its row with Moscow over Turkey’s downing of a Russian military aircraft near Syrian air space. After the ouster of Mestan, who went on to form his own party, a triuvirate including Karadaya was put in the charge of the party pending the holding of a national conference. The April 24 national conference also formalised the continuing decisive influence of Dogan over the party by entitling the honorary president to convene meetings of the central operative bureau, central committee and central control commission of the party. At the time that the central committee axed Mestan, there were complaints from the Mestan camp that the meeting, which was held at Dogan’s home, had not been properly constituted. The changes to the rules formally enable Dogan to intervene in the running of the party at any time of his choosing. Responding to his election, Karadaya said, “with our cause in our hearts, with our collective power and will, and with our efforts, we can achieve anything. When there is a will, there is a way”. 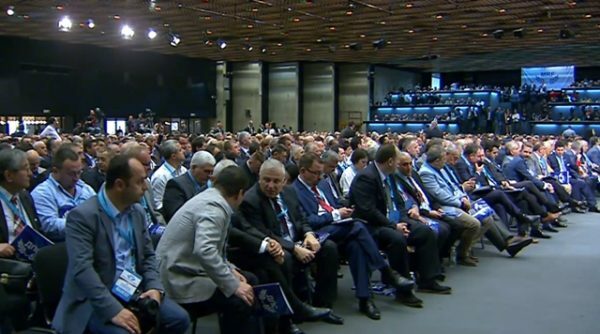 Dogan was present at the conference in Sofia, his first such appearance since the 2013 event when Mestan was elected party leader. That occasion was remembered less for the election of Mestan than for an incident in which Oktai Enimehmedov rushed on stage pointing a gas pistol at Dogan. On April 20 2015, the Supreme Court of Cassation confirmed a sentence on Enimehmedov of three and a half years in jail for threatening to murder Dogan.